In an earlier post we asked if you were ready for your own website. But what if you have a website already and you want to know if you’ve outgrown it? 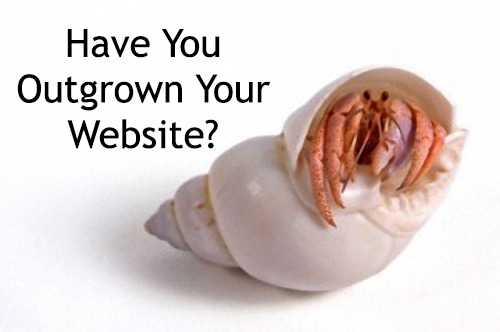 Websites are like hermit crabs. As the hermit crab grows, it has to keep changing out its shell in order to survive. Your website is no different. A free site like Blogger or WordPress.com may have fit in the beginning when your needs weren’t as large, but now you may want to expand and do things the free sites won’t allow you to do without you violating the terms of service. Advertising and e-commerce are the biggest reason people end up leaving these free sites. Maybe you want to start running some affiliate ads, or put a shopping cart on your site. Maybe you want to customize the theme or the plugins you’re using and just can’t do it. Growth is a given when it comes to your business. Let’s take a look at some of the biggest clues that tell you you’ve outgrown what you’ve got. Business Model. One of the biggest reasons people redesign their sites is when they’ve changed their business model. Sometimes that change isn’t intentional. You’ve drifted in a new direction and the look you began with no longer sends the message you want to send. All you know is, it’s just not working anymore. And if that change was intentional? Then you already know in your heart of hearts the site isn’t working the way you want or need it to. Clutter. Clutter and poor navigation are the number one killers of websites. If a visitor can’t immediately find what they want, they won’t stay and they certainly won’t hire you. Have you added so much stuff over the years you have a bizillion links in your navigation bar? Worse yet, are YOU having problems finding what you want on your own site? Have you received any emails from visitors asking where they could find something? No? Maybe they couldn’t find your contact form or your email address either. Competition. What is your competition doing? If your site doesn’t look as spiffy as some of the others in your industry, you’re going to lose potential clients. I know if I visit a site that’s outdated, I won’t bother staying. They may be good at what they do, but if the site doesn’t appeal to me it makes me wonder what else about them is out of date. Frozen In Time. Is your site narrow? Do you have one of those annoying little pop up avatars of yourself that wanders onto the screen and starts talking? Do you have music in the background and animated gifs all over the place? All that was fine for 1995 when the average width of a website was 700 pixels wide and sound effects were all the rage. Today we have much wider screens, pop ups of any kind are irritating, and no one puts mood music on their sites. Multi-media has advanced a lot over the last ten years or so and there are much better, more appealing ways to include it. Browser Compatibility and Mobile Devices. If your site only looks good on Internet Explorer 6, you’ve got a problem. Browser compatibility is tricky under the best of circumstances, but throw outdated code into the mix and that’s a sure recipe for disaster. Also take into consideration how your site looks on mobile devices. Not only does it have to fit on the big, wide screens, it has to fit the small screens as well. Are You Taking Advantage of The Latest Technology? Blogging and social networking isn’t just for kids anymore. Both have become a valuable tool for building a web presence. Interaction with your clients and potential clients is a necessity, whether it’s through Twitter or Facebook, or through the comment section of your blog. If any of the above points have you shaking your head at your own site, it may be time for you to change that shell out for a larger one. How does your site measure up?